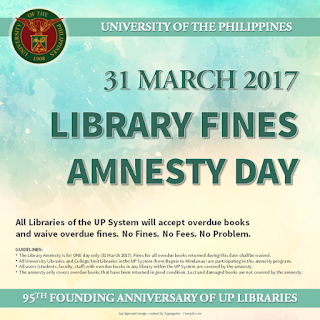 On 31 March 2017, there will be a Library Fines Amnesty Day. The Library Amnesty is for ONE day only with fines for all overdue books returned during this date shall be waived. All University Libraries and College/Unit Libraries in the UP System (from Baguio to Mindanao) are participating in this amnesty program. All users (students, faculty, staff) with overdue books in any library within the UP System are covered by the amnesty. The amnesty only covers overdue books that have been returned in good condition. Lost and damaged books are not covered by the amnesty. March is the month of the Founding Anniversary of UP Libraries. For 2017, the lineup of activities will be from 6-31 March 2017. Theme for the 95th Founding Anniversary of UP Libraries is "Building for the Future: Towards the Modernization of UP Libraries".